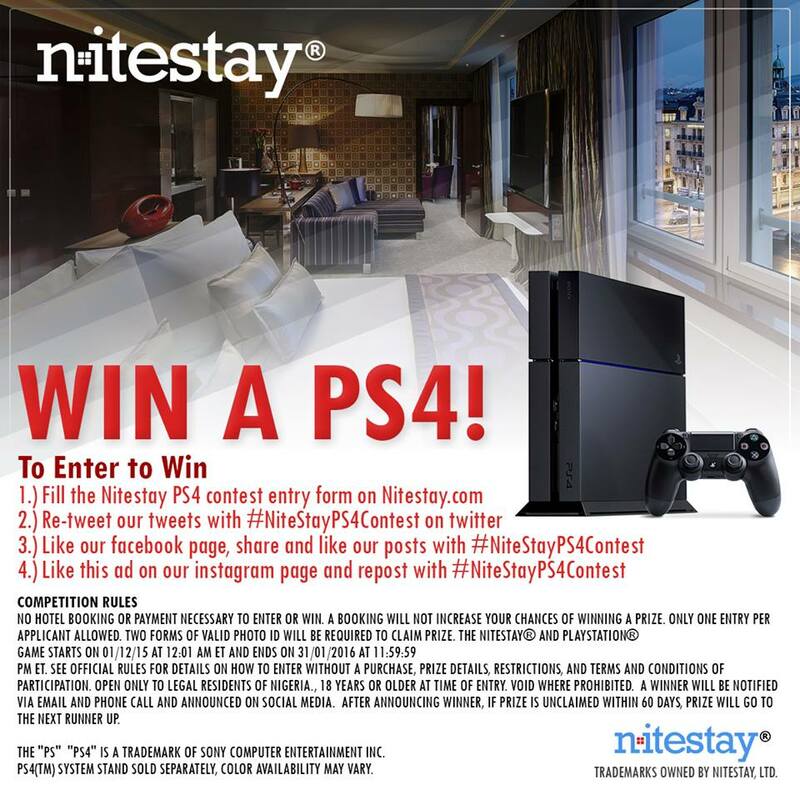 The Nitestay PS4 Contest is now live! NO HOTEL BOOKING OR PAYMENT NECESSARY TO ENTER OR WIN. A BOOKING WILL NOT INCREASE YOUR CHANCES OF WINNING A PRIZE. ONLY ONE ENTRY PER APPLICANT ALLOWED. TWO FORMS OF VALID PHOTO ID WILL BE REQUIRED TO CLAIM PRIZE. THE NITESTAY® AND PLAYSTATION® GAME STARTS ON 01/12/15 AT 12:01 AM ET AND ENDS ON 31/01/2016 AT 11:59:59 PM ET. SEE OFFICIAL RULES FOR DETAILS ON HOW TO ENTER WITHOUT A PURCHASE, PRIZE DETAILS, RESTRICTIONS, AND TERMS AND CONDITIONS OF PARTICIPATION. OPEN ONLY TO LEGAL RESIDENTS OF NIGERIA., 18 YEARS OR OLDER AT TIME OF ENTRY. VOID WHERE PROHIBITED. A WINNER WILL BE NOTIFIED VIA EMAIL AND PHONE CALL AND ANNOUNCED ON SOCIAL MEDIA. AFTER ANNOUNCING WINNER, IF PRIZE IS UNCLAIMED WITHIN 60 DAYS, PRIZE WILL GO TO THE NEXT RUNNER UP.